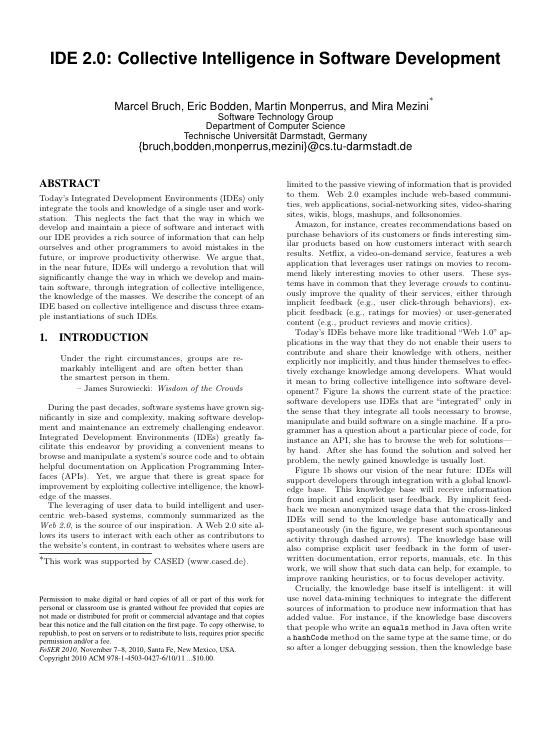 To appear at the 2010 FSE/SDP Workshop on the Future of Software Engineering Research (FOSER). Download the paper here. Abstract: Today’s Integrated Development Environments (IDEs) only integrate the tools and knowledge of a single user and workstation. This neglects the fact that the way in which we develop and maintain a piece of software and interact with our IDE provides a rich source of information that can help ourselves and other programmers to avoid mistakes in the future, or improve productivity otherwise. We argue that, in the near future, IDEs will undergo a revolution that will significantly change the way in which we develop and maintain software, through integration of collective intelligence, the knowledge of the masses. We describe the concept of an IDE based on collective intelligence and discuss three example instantiations of such IDEs.